Fr. Uwe Michael Lang “of the Oratory” has given us a succinct, well written account of the movement to restore the presence of the sacred and the awareness of beauty within the Catholic Church. He provides those engaged in this effort a helpful guide to the relevant theory, tradition and authority. Fr. Lang then turns to recent Catholic theological challenges to these concepts. I found this chapter particularly helpful since I doubt I could ever have forced myself to wade through the works of Karl Rahner or Schillebeeckx. For highly influential schools of conciliar and post-conciliar theology in fact deny that any separate category of the Sacred can exist after the Incarnation. Post-incarnation, according to these thinkers, the entire world is sacred. It’s the kind of idealistic sleight-of-hand in which “what was sacred before” becomes positively harmful. Indeed, it seems to me hard to distinguish these theologies from outright atheism. The links of this line of thought to (emphatically non-theistic) avant-garde aesthetic theories are also obvious. In any case, it is obvious that behind many of the so-called “liturgical abuses” stand philosophical and theological tendencies that need to be engaged and refuted. There follows an intriguing “excursus” discussing the issues raised by televising liturgies. Fr. Lang then applies the analysis developed thus far in three subsequent chapters dedicated to Sacred Architecture, Sacred Art and Sacred Music. 4. “Iconoclasm is not a Christian option” (quoting Cardinal Ratzinger) – a purely abstract art is inappropriate. Those even remotely familiar with recent “official” Catholic architecture can judge for themselves the extent to which these principles apply today. As noted, this book helpfully provides some telling illustrations of the problem. On Sacred Art, Fr. Lang shows us the crisis of an art from which the very concept of beauty has disappeared. And he concludes that beauty can only be recovered if the liturgy is restored. On Sacred Music, Fr. Lang shows the disastrous state of religious music, caught between the “two millstones” of “puritanic functionalism” – in which the Church’s musical heritage is replaced by congregational singing in the name of “Active Participation”– and the “functionalism of accommodation” in which music derived from contemporary jazz and pop makes its way into the sanctuary. In this analysis, as so often elsewhere in Signs of the Holy One, Fr. Lang proceeds from ideas of Cardinal Joseph Ratzinger. We can only regret how little of his perceptive thought Pope Benedict XVI was able to put into practice in his papacy. 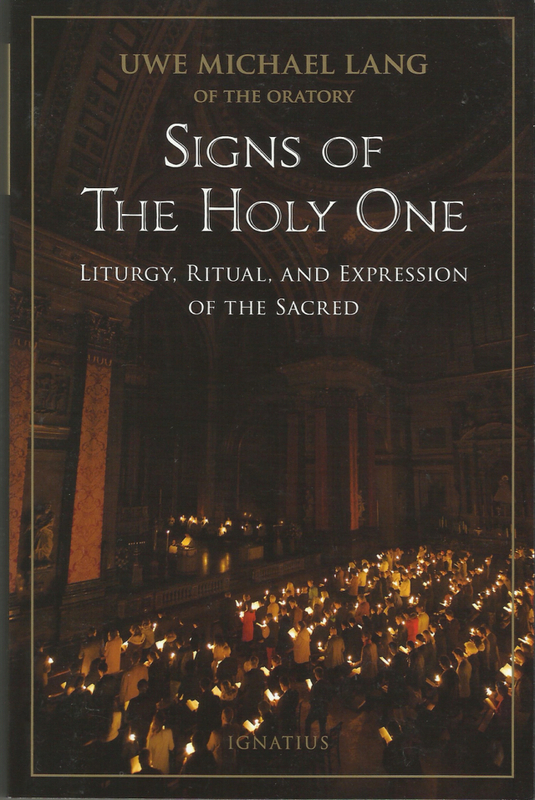 Signs of the Holy One is written in a clear yet scholarly style. Fr. Lang carefully analyzes in each case the relevant authority. But that authority is not limited to the Vatican II and the post–conciliar popes but encompasses earlier councils and papal pronouncements. The works of the 18th century Benedict XIV are especially remarkable. Furthermore, abundant references and citations to leading authors on the topics covered making this work a gold mine for further research. The authors cited include some, like Jean Clair and Martin Mosebach, who bring a much more impassioned and poetic tone to Fr. Lang’s calm text. I might have wished at times for more concrete and more contemporaneous examples to illustrate what the author discusses. I am not sure, for example, how effective it is to critique Beuron art, Augustus Pugin’s advocacy of the Gothic, the playing of Verdi’s music in a church in Sicily in 1860 (as depicted in a 1962 movie) and Wagner’s Parsifal. These critiques invite debate (how, for example, is Parsifal “blasphemous”?) and don’t we have much more recent, more vivid examples before us – such as the Copacabana Beach Mass of Pope Francis or the Venice exhibits of Cardinal Ravasi? Fr. Lang frankly concedes his disappointment on the failure of the ideas advocated by this book to progress during the papacy of Benedict XVI. Under the new regime will they remain as just the personal whims of the “pope emeritus”? Fr. Lang correctly points to the continuing and developing search for the sacred and the beautiful in liturgy among younger Catholics as a basis for hope. Yet mending the “torn threads of Catholic ritual” “is a work that will need patience and perseverance and will not be completed in our lifetime”: (p.155) Those engaged in that work, however, will require not just commitment and energy but also knowledge and understanding. In this regard, with Signs of the Holy One Fr. Lang has provided them with an indispensable handbook.